← Poppy Filled Ring Roll… or something. This year, Food Network Magazine included a little booklet on Stuffing in their Oct/Nov issue. It’s also on their website with even more recipes. I originally thought that I’d try one of their recipes but none of them were quite right. Still, they were ideas. So I looked around then finally took about five different recipes (plus a raid of my pantry) and built up a stuffing recipe that sounded like I’d actually eat it. On Thanksgiving, I scooped up a bit of stuffing. I wasn’t sure if my cobbled together chimera of stuffings would come out right, but the first bite put those fears to rest. This was MY stuffing. 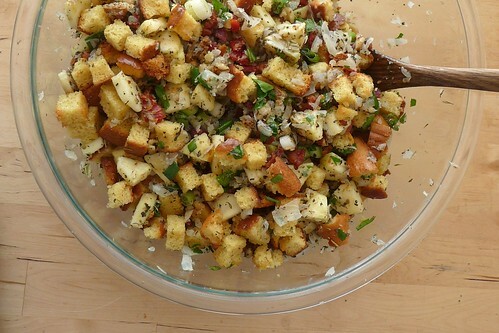 The stuffing I could eat happily. I had two helpings and then proceeded to snack on the leftovers for the next few days. Everyone else liked it too, but there were some wishes from those assembled that it held together a bit more. And I wished I’d drizzled on a bit of the juices from the turkey. It was great without it, so I’ve written it in as an optional. 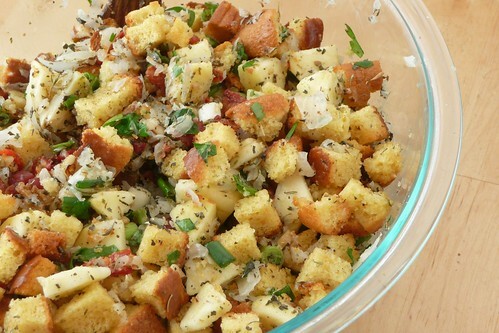 Boy, I’m happy I decided to make a stuffing at last. I loved it! Spread cornbread cubes in a single layer on a sheet pan. Bake at 350F for 20 – 30 minutes, or until golden brown. Cool and remove to a large bowl. Cook bacon ends in a skillet over medium-low heat until fat is rendered and bacon is cooked to your preferred doneness.1 Pour bacon and drippings over the cornbread cubes. In the same skillet, melt butter over medium heat. Saute onions with a pinch of salt until tender, about 5 minutes. Pour onions and butter over the cornbread mixture. Add all remaining ingredients and toss to mix thoroughly2. I like my bacon to be a little chewy when it’s used in other recipes like this. I used a 5 qt mixing bowl with a lid and shook it a few times before I used my hands to fold it all together. Damn near filled up the whole bowl too. As Alton says, “stuffing is evil.” Don’t stuff your bird, there’s risk of salmonella because the stuffing won’t reach 165F inside the cavity. Just bake it on the side and enjoy. This is a pretty easy recipe to make gluten- or dairy-free. Just use your favorite GF cornbread recipe or mix (I’ve heard good things about Pamela’s Cornbread Mix) and substitute Earth Balance Buttery Sticks (or similar) for the butter. This entry was posted in american, bread, dairy-free, gluten-free, holidays, recipes, side, untranslated. Bookmark the permalink.